Climate change goes beyond warmer weather and more extreme floods and droughts. Effects are expected to include changes to the water quality of our rivers and lakes as well. This has implications for the vulnerability and sensitivity of freshwater ecosystems, as well as water quality limit-setting and catchment nutrient management. These issues, and more, were discussed at a Department of Conservation workshop held last week on the implications of climate change for freshwater conservation. 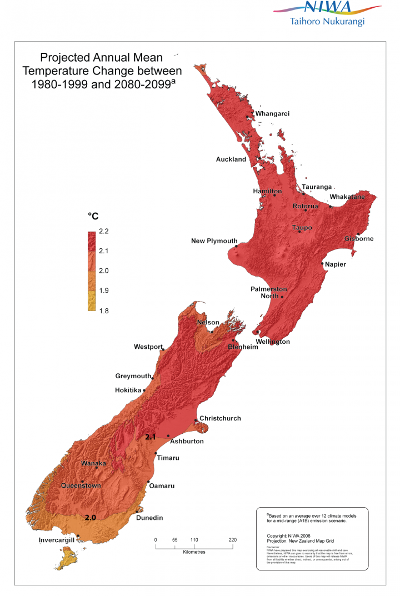 Middle-of-the-road projections of climate change indicate a rise of about 2°C in average temperatures across New Zealand by 2080-2099 compared with 1980-1999. One of the most important aspects of water quality is temperature, and as the air warms so too will the water. New Zealand has already seen an increase in air temperature of about 1°C over the last century; over the next century, projected changes are closer to 2°C, depending on how global greenhouse gas emissions develop. Warmer waters would shift the range of freshwater fish south and higher in elevation, depending on the species. The ranges of some species may increase, while others may decline. For natives, this would be influenced further by shifts in the ranges of predator species such as trout. Warmer waters also make algal blooms more common. Water temperature is also susceptible to changes in the flow regimes of rivers and streams. With more frequent or longer droughts over much of the country, particularly the east, we can expect more pronounced periods of low flow, at least the smaller catchments. These lower flows would mean that water temperatures climb even higher. At the other extreme, the more intense rainfalls would lead to more intense erosion, delivering sediment to waterbodies – another important aspect of water quality. But we must be careful about extrapolating here. While the most intense storms are likely to become more intense, the less intense storms may not and there may be fewer of them. Studies of long-term erosion under climate change have thus been equivocal. For nutrient such as nitrate (N) and phosphorus (P), there is little we can say at present, as a lot will depend on land use change. One study out of the University of Waikato warns that by the end of the century the warming of lakes could have a similar effect on trophic status as a 25-50% increase in catchment nutrient loads. With rising sea levels of about 50-100 cm by 2100, lakes, rivers, wetlands and aquifers along the coast would experience an increase in salinity. Intermittently closed and open lakes would be open to the sea more often, and salt wedges and tidal influence in streams would reach further inland, both influencing aquatic habitat and biodiversity. Waterborne diseases are also on researchers’ radars with an interactive map of projected impacts recently released by ESR in collaboration with other organisations. Changes in temperature and precipitation, floods and droughts, can influence the potential to contract these diseases for better or for worse. But on top of climate change we also have land use change, and the two will act in concert. Some land use changes are themselves liable to result from climate change, whether for the purposes of mitigation (e.g., carbon-farming forests or smaller herds of methane-emitting ruminants) or adaptation (e.g., shifts in crop choice and management in response to water resource stress). So what can we do about all of this? In some respects water quality is almost bound to change (temperature, salinity near the coast), in others it’s unclear (sediment). The first suite of options to consider, then, would be those with no regrets: riparian planting along streams, erosion control, no more than optimal fertiliser use, and so on. These are actions with benefits no matter how the climate changes. Another matter to consider, at some point in the future, is the setting of water quality and catchment load limits that account for the “likely effects of climate change”, as recommended by the Land and Water Forum‘s third report. And of particular relevance to DoC would be the development of conservation strategies that account for the biodiversity threats posed by degrading or shifting water quality in a warming world. It’s clear to me we need to act now. The 2 degrees is going to scorch the earth red. I don’t want to see that. Agricultural runoff into our Mississippi River is creating a dead zone in the Gulf of Mexico the size of our US state Connecticut. In fact, the agency in charge of protecting our waterways (i.e., the Environmental Protection Agency) recently had to be sued in order to force it to comply with a report concerning runoff standards they had agreed to completed years ago. I guess “nitrate pollution” is a problem worldwide.